"Saté1. Metro center / 12th st & G st nw Saté2. 19th st & L st nw / 1920L st nw Saté3. Private party"
Great food with large servings. I've tried 17 food trucks and this is in my top 3. The skewers are juicy flavorful meat, the vegetables taste slow-cooked, and the peanut sauce was mild enough not over-power what it touched. Hands down my favorite truck. When this truck arrives I gather up my workmates and tell them it's here. Not only is the Chicken Sate the best around, the fritters are amazing as well. The combo is excellent- it has tastes of everything. Even if you aren't a veggy fan, trust me, the veggies are great! Bonus- there is a brick and mortor restaurant in Alexandria as well with excellent Lamb! One of the worst meals I've ever had. No seasoning, no flavor, no color. A watery broth over everything including the fritters! They do not know how to cook food for vegetarians. Terrible! And the guy was not friendly at all. Will never go back here and I suggest you don't either. Went to subway for lunch but on my way back to the office walked past this truck and was lured in by how delicious it smelled. Luckily I saw that they had a menu option for items that were $1 so I ordered both the chicken skewer and the corn fritter. OMG. Best $2 I have spent of food. I will be going to this truck ASAP when they return to Farrgut square for a full lunch. DELICIOUS. The skewer was perfectly cooked and tender, with delicious sauce. And the corn fritter was amazing. GO HERE! Wow, how sad. This was an entirely tasteless dish of tofu, tempe, noodles, and corn fritters or some such thing, drowned in a tasteless broth. A bit of a mess, I must say. Perhaps I ordered the wrong thing, but if that's the case, don't serve it! Pete's Dinner manages to serve a fantastic veggie special and it's all quite tasty. Service was great, fast prompt, friendly. The wonton was good to start with, nice that it was included. Peanut Sauce and chicken skewers were excellent, the chicken was perfectly cooked, the sauce well done, these two standard I feel put the truck at par for the course. The Beef Curry was well above average the beef was just the right for tenderness, not falling apart but very good. The curry sauce itself was spicy as well but not "out to get you"
The corn fritter was an unexpected treat, crunchy, and savory, the corn itself added a touch of sweetness that balanced out well. Coconut Rice was above average, a nice touch. I would go here again. The food was good and the service was nice. DO NOT USE YOUR CARD here. Went with a group of friends and 2 of them used their cards to pay. Both of their card information was stolen and was used the following day in places all around the state. Will not be returning due to this shady incident. 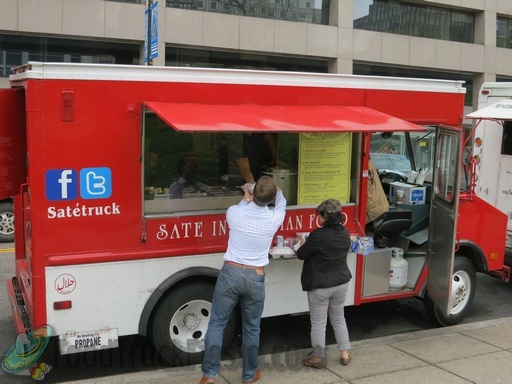 I have been to a bunch of food trucks and was impressed with Sate. I ordered the Chicken Curry. Great flavor and some spice to it. I was definitely full afterwards. Please come to Farragut often. Not my fav. The food was edible, but the chicken tasted a little funky, and the veggies tasted pickled, even though I'm pretty sure they weren't. 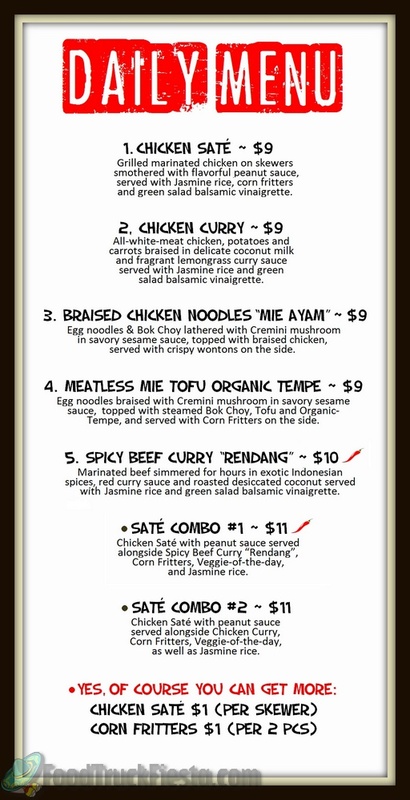 Sate launched around May 21, 2012 (officially on June 5) in Washington, DC serving Indonesian food.